This Spinach and Chicken Phyllo Bake is so filling and flavorful, you’re going to want to make it again and again! I’ve been intimidated to work with sheets of phyllo dough in the past but I found out I was being silly – this was easy! 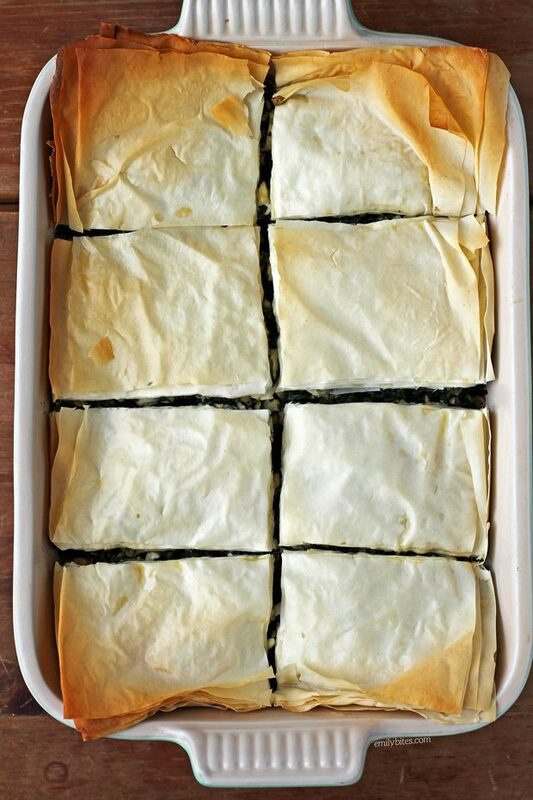 My husband loves spanakopita, so I knew this recipe was going to be a big hit in our house. It has similar flavors but with the addition of meat…what’s not to like? The seasonings on the filling are so good and I love the crispy, flaky phyllo layers. A serving of this Spinach and Chicken Phyllo Bake is huge, satisfying, and just 358 calories or 6 SmartPoints on the Weight Watchers Freestyle program! 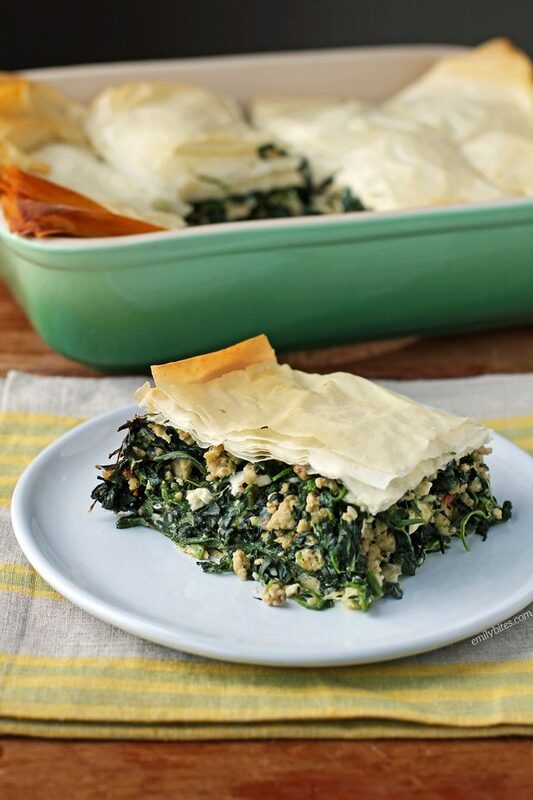 Looking for more tasty lightened up chicken recipes like this Spinach and Chicken Phyllo Bake? Check out my Chicken Pot Pasta, Buffalo Chicken Dip, Mexican Chicken Cauliflower Rice Skillet, Buffalo Chicken Stuffed Sweet Potatoes, Bruschetta Topped Balsamic Chicken, Lemon Chicken Orzo, Greek Chicken Tacos, Baked Chicken Tenders, Chicken Cordon Bleu, Cheesy Buffalo Chicken Potato Bake, Mediterranean Topped Grilled Chicken, Barbecue Chicken Enchiladas, Chicken Parmesan Stuffed Shells, Slow Cooker Kickin’ Chicken Pasta, Pimento Cheese Stuffed Chicken, Buffalo Chicken Soup, Cheddar Ranch Chicken Tenders, Spicy Southwest Chicken Wraps, Cream Cheese Stuffed Everything Chicken, Cheesy Bacon BBQ Chicken, Bubble Up Chicken Pot Pie Casserole, Creamy Chicken and Wild Rice Soup and so many more in the Chicken section of my recipe index! Pre-heat your oven to 375 degrees. Lightly mist a 9×13 baking dish with cooking spray and set aside. Mist a large saute pan or walled skillet with cooking spray and bring to medium-high heat. Add the chicken and onions and cook for 7-10 minutes, breaking up the chicken into bite-sized pieces with a wooden spoon or spatula, until the chicken is cooked through and the onions are softened. Drain if liquid is present. Add the pepper, oregano, salt, nutmeg, red pepper flakes and garlic and stir to combine. Cook for another minute until fragrant. Add the spinach and stir until well combined. Cook for a few additional minutes (if the spinach produces liquid allow it to evaporate) and then transfer to a large mixing bowl. Allow to cool a bit for 8- 10 minutes. Add the beaten eggs, feta and mozzarella cheese and stir together until well combined. Remove the defrosted phyllo sheets from packaging and place them under a layer of plastic wrap covered by a damp towel to prevent drying. Take out one sheet at a time (a total of 8 sheets) and lay it in the bottom of the prepared baking dish, misting the entire sheet with cooking spray before adding the next sheet until you have a stack of 8 sheets layered in the bottom of the dish. Mist the top phyllo layer and then top with the spinach/chicken mixture. Spread the mixture evenly across the phyllo in the baking dish. Top with another 8 sheets of phyllo dough, misting each layer with cooking spray in between and top with a final mist of cooking spray. Cut the casserole into 8 servings (if you try to do this after baking it will be very messy/flaky). Place the dish in the oven and bake for 35-45 minute until the top is golden brown. Could you make this without the dough? What kind of cooking spray do you use? Or do you have olive oil in a mister? Have you ever tried this with reduced fat or FF Feta? Would you know how much the points would be reduced if not using full fat? Thank you. What do you eat this as? Your dinner? What do you serve along with it? Is it filling? Nope, I have always used regular feta cheese. I only have the points calculated for the recipe as I post it, so if you want to make changes I suggest running the ingredients you’re using through the recipe builder on the WW website! I served this for dinner and it was super filling. Do you think you could freeze leftovers? I’ve never tried freezing it, if you do report back! Where do you find 99% fat free ground chicken? I have not had luck At tops or Wegmans. I can only sometimes find it at Wegmans. If I can’t I just substitute their 99% ground turkey or buy chicken breasts and grind them myself with my kitchenaid or throw them in the food processor. Thanks so much for sharing and creating this! I recently discovered spanakopita at a local Greek restaurant. Can’t wait to try your version! So excited to make this tonight! I’ll report back. But since your recipes have never failed me, I’m pretty sure my report will just be “Emily is awesome, as always.” 🙂 Thanks for all the hard work you put into this! This was absolutely amazing! I made it just as the instructions said and LOVED it! So did the hubby. Will make this again for sure! Made this last night for dinner and it was delicious! Very filling and super easy! I’m so glad to hear you loved it!